"What sight is more dread than the cavernous interior of an ogre's mouth? Ogres are born hungry. Their appetite can never be satiated. For them, life is a never ending quest for the next meal. Don't be that meal." Wortimer Greatspear, Famed Dungeoneer & Publisher of the acclaimed Wisdom for the Witless guidebook series. Fighting an ogre is not an option for greenhorn adventurers, and should be left to the seasoned combatant or the magically well endowed. It’s gnarled and stone-like skin is almost impenetrable to cutting weapons. Indeed, it's hide can be fashioned into a natty armour that's tougher than plate but flexible like leather (although the potent, lingering smell means this is only an option for the nasally challenged dungeoneer). Ogre's sink. As a result Ogre's have acute hydrophobia, and this can be used to the advantage of the wily dungeoneer. Take up a vantage point in the nearest river, lake, pond or moderately sized puddle. The ogre's top heavy construction is another exploitable weakness. If upended, an ogre can get 'stuck' headside-down, much like a turtle stranded on it's back. Of course, destabilizing the massive beast is easier said than done. Tip: lubricate the combat arena with a smidgin of death jelly or (war snail) mucus. Greatspear suggests one last option. Get swallowed whole. 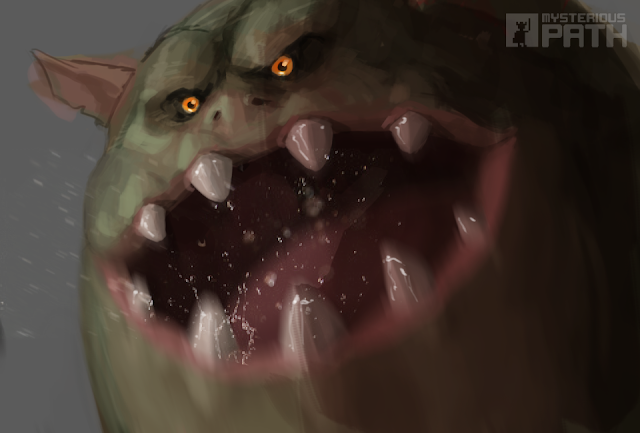 The kingdoms top nutritionists/druids/dietitians hypothesize that there are two factors that contribute to the ogre's perpetual hunger: 1) It doesn't chew it's food. 2) It doesn't digest its food properly. Learn more about this lumbering killing machine. This is shaping up to be a fun parody of the old cheese, but given a new flavor. I look forward to the final game. Thanks Nicholas. Think it will be a while before I create anything 'final'. I'm time poor but chipping away at it. Might actually put a few prototypes up at some point this year!